Ascend! Climb! Great metaphor to guide us this week as we think together about pressing upward in Christ. I’ve got my commemorative Scout hiking stick! And we are hoping that, trusting that, this week will be a time you will look back on fondly on this as a time when you perhaps reached new heights, even if it is merely resting and relaxing, breathing deeply as we walk together this week. “[E]very time I hiked into the Bugaboos, I passed a fancy lodge run by Canadian Mountain Holidays, which flies skiers and hikers around the hills. And every time I hauled a heavy pack up the trail and huddled in a wind-battered tent, I wondered what it would be like to experience the mountains and retreat to a comfortable bed at night. “So a couple of days after walking out of the woods in the rain, I helicoptered up to the Bobbie Burns Lodge in the Purcell Mountains, north of the Bugaboos. “Instead of getting up in the middle of the night and choking down an energy bar, I slept in, ate a fantastic breakfast, and then, at the crack of 9, climbed into a helicopter with guides. We were dropped off in an alpine meadow and spent a day hiking up to a ridge, admiring wildflowers, the rugged terrain and expansive views. In the afternoon, a helicopter ferried us back to the lodge for cocktails and a fine dinner. “While I certainly had a pleasant day, I didn’t feel the connection to the natural world that I usually seek by going into the wild. A helicopter was a radio call away to whisk us back to the comforts of the lodge in case it started raining, which it did. “[A]t 3 a.m. [he] set off for South Howser (10,800 feet). We crossed a glacier, climbed a pass, trudged over another glacier and dropped into a valley on the other side. By daylight we were looking up at the sinuous buttress of South Howser, a beautiful, soaring sweep of granite, as elegant and as simple as a single brush stroke on a canvas. “Fifteen pitches of flawless yet challenging climbing and some scrambling put us on the summit 10 hours after starting. The sights were incredible. Fingers of sheer granite rose out of the surrounding glaciers, mountain after mountain ranged in the distance. It was like being back in a helicopter. In ancient Israel, the people of God saw themselves as on a journey – and this idea has continued through into the Christian experience for the last 2000 years as well. We are on a journey through this life. This life is not our final destination. This place, Central Florida, Winter Park, Winter Garden, Holland as the case may be, Earth!, is not our real home, not our final destination. That destination is God’s presence. And all this life is preparation for that. We are made for something much more. The writer of Hebrews captured it when he said, “Since you knew that you yourselves had a better possession and an abiding one.” That better possession, that more abiding place is the Kingdom of God in its fullness. Our final and eternal home. Well, in the OT, the people of God were reminded at least three times each year that they were pilgrims. Out of obedience to God, they left home and set out for Jerusalem – that symbol of God’s presence – in order to make sacrifice. The Psalms of Ascent – Psalms 120-134 – most scholars agree are the songs they sang on the road. These psalms became a sub-set of the hymnal of Israel, a collection that many people think were liturgical songs meant to be sung during the three journeys every year when people went up to Jerusalem for the festivals of Passover, Pentecost, and Rosh Hashanah. From everywhere in Israel, going to Jerusalem means going up. Now I realize that this is a hard concept for us in Florida – the highest point of land is the interstate over pass (still looking for the “mount” in Mount Dora!). But think about being in the mountains – going up is hard. So these songs were song of faith, as the people trudged upward, seeking God in their journey. It was not a vacation, it was pilgrimage. And so our lives as well. The 15 psalms seem to break into five triads, five groups of three – nice for us because we have three more talks like this Wed/Thurs/Fri morning before we gather for one final time together on Saturday morning. The three broad topics also depict three potential aspects of a long journey: Trouble, Trust, and Triumph. Another way to see this, a way that I want to use this week is “Distress, Dependence, and Deliverance.” So five times, the psalms seem to take us through this cycle of trouble and distress, to trust and dependence, and finally to triumph and deliverance. We see this three-part idea in the first lines of Psalm 121, our theme for the week. First, “I lift up my eyes to the hills. From where does my help come?” He sees trouble coming, so it’s an expression of distress. We look up and see the obstacles, the challenges of life, the trouble we are about to encounter. There is no way around this mountain – we have to go over. We are troubled and we face trouble. There is no interstate highway weaving nicely through the mountains with cuts and fills. It’s scaling, climbing, and at first glance, it’s distress and trouble. Have you ever been there? Like in the last day or two? I know that sometimes, it is hard even to get here – things seem to happen, trouble gets in the way. Sometimes the mountains seem unscaleable. But as Bilbo Baggins told Frodo, every journey begins with a first step. “It’s a dangerous business, Frodo, going out of your door. You step into the Road, and if you don’t keep your feet, there is no knowing where you might be swept off to.” Isn’t that the truth! Some of us stepped out the door and have been swept off our feet into the land of disability. And we live, unfortunately, in a culture that has very little patience for the long haul – people want you to fix it, get over it, recover and move on. But for many of us, there is no moving beyond the new reality we face. We’ll talk tomorrow morning about this idea of Trouble and Distress and how this is part of the pilgrim’s journey. 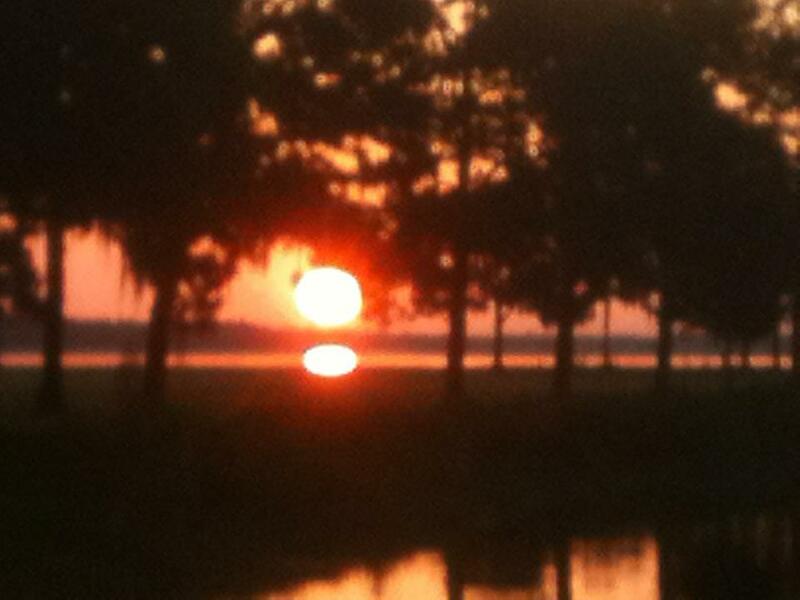 But Second, “My help comes from the LORD, who made heaven and earth.” Here is trust, an expression of dependence. Trust is surrendering your self-sufficiency and placing yourself at the mercy of another. The psalmist admits he cannot conquer the mountain on his own – he needs to place trust in another; he needs to depend upon another. It’s admitting our inadequacy and recognizing God’s amazing bigness for us. And trusting God is far different from capitulating to defeat. We will talk more about this trusting and dependence on Thursday morning. And finally, Third, “He will not let your foot be moved; He who keeps you will not slumber.” Here is triumph. This is a declaration of deliverance. It’s also, in the face of overwhelming evidence to the contrary, a statement of faith in something we do not see. It’s making it to the top through the sheer grace and mercy of a God who loves you and carries you to see new things from new places. So we are going to spend this week talking about climbing, hiking, struggling, step by metaphorical step upward, fighting gravity, fighting the downward pull of the fallen nature of creation. One of my favorite authors, Eugene Peterson, calls this act of faithful journey “a long obedience in the same direction.” Think about that. None of us necessarily asked for the challenges we face and we live with. But we are called in God’s providence to plod onward, upward – not in defeat – but with expectant hope that even though we may be in distress, with hope in God and His goodness, through dependence on Him, we move, with the Holy Spirit’s help, toward deliverance. And the amazing thing is, while the “final” deliverance may be some future release, there can be – here and now – real deliverance in this journey, in this long obedience. That’s the perspective we want to cultivate here. We don’t want to “settle” for less. So let’s climb this week, make some memories together in our journey with Christ. Aim high – look up. Yes there are mountains, but the view from the top will be amazing. When you’re going to have a baby, it’s like planning a fabulous vacation trip – to Italy. You buy a bunch of guide books and make your wonderful plans. The Coliseum. Michelangelo’s David. The gondolas in Venice. You may learn some handy phrases in Italian. It’s all very exciting. It’s just a different place. It’s slower-paced than Italy, less flashy than Italy. But after you’ve been there for a while and you catch your breath, you look around . . . and you begin to notice that Holland has windmills . . . and Holland has tulips. Holland even has Rembrandts. But everyone you know is busy coming and going from Italy… and they’re all bragging about what a wonderful time they had there. And for the rest of your life, you will say “Yes, that’s where I was supposed to go. That’s what I had planned.” And the pain of that will never, ever, ever, ever go away . . . because the loss of that dream is a very, very significant loss. So, part of our family was away last week at “camp” — we spent the week at Lake Yale (from where the masthead pic on this blog came last year!) participating in “Breakaway” the disability family retreat sponsored by our friends at Lift Disability Network. It was great to have Mary come this year, and even more cool to have Shoshanah and Josiah serve on the “crew” as helpers for families. But perhaps most fun was that Jessica joined us for the week. It took a lot of logistical planning (transportation, medicines, food, and care planning), but it worked. 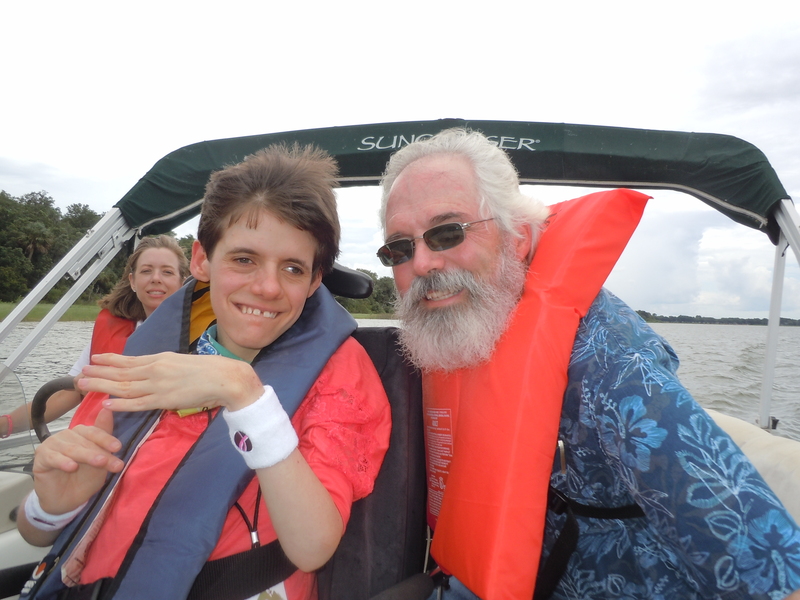 Jessica had a great time – enjoying the music and people, a fun-filled, laughter-filled boat ride (first time! ), a long, relaxing swim in the pool, and all the other events (a “starry night dance,” ice cream social, “messy games” and so much more). But more surprising was her impact on others. She never says a word – she just shows up – and people are affected. Numerous people on the crew testified to her impact on their lives. One was asked about the most important part of the week. This person said one word: “Jessica.” Now I have to admit, that it puzzles me – but it shouldn’t because I often tell people that God hardly ever does things the way we expect and He almost never uses the people we think He would use to achieve His ends. He is in the business of using those more often over-looked, rejected, and marginalized by the culture to achieve His plans. We saw this truth again this week with Jessica. Searching my own blog, I see that I wrote something kind of similar back in January – but it has been worth noting again. The young lady continues to surprise me with her silent impact on her world. Thanks be to God!